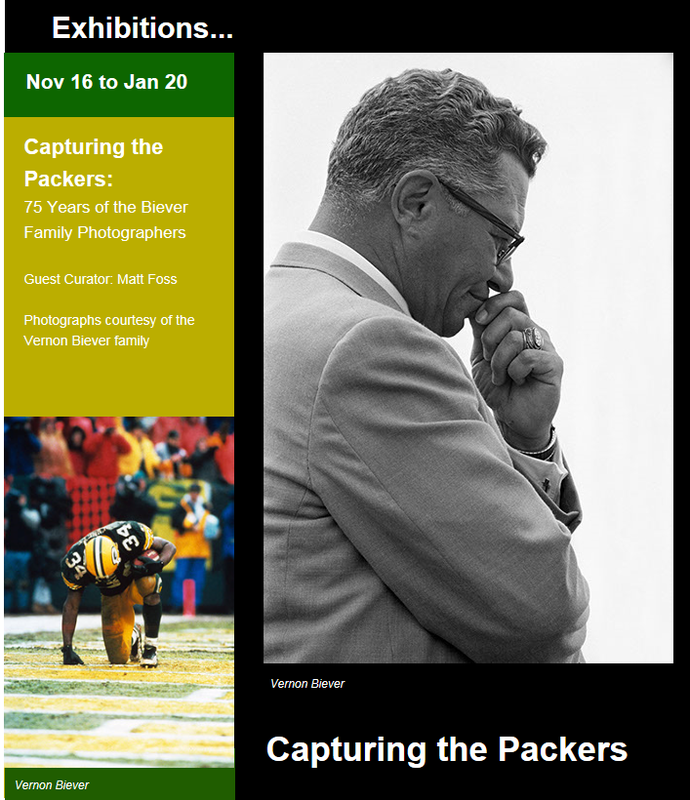 As a long-standing partner of the Green Bay Packers, Associated Bank is proud to sponsor “Capturing the Packers: 75 Years of Biever Family Photographers” curated by Matt Foss, at ArtStart in Rhinelander. This exhibition includes 55 photos by Vernon, Jim and John Biever. The Biever family has served as the official photographers of the Green Bay Packers since 1947. They have captured iconic Packers moments that speak to the joy and heartbreak that is the game of football. The public is invited to this free exhibit every Thursday, Friday and Saturday, 11 a.m. to 5 p.m. through January 20th, 2018. The exhibit will showcase the last 75 years of Green Bay Packers history and focus on the incredible Packer personnel who have made the Green Bay Packers world famous including: Don Hutson, Jim Taylor, Paul Hornung, Lynn Dickey, Reggie White, Willie Davis, Max McGee, Ray Nitschke, Bart Starr, Brett Favre, Aaron Rodgers and many others. The collection includes many famous photographs: Pete Rozelle awarding the AFL-NFL World Champion Game trophy to Vince Lombardi; the moment Richard Rodgers catches the “Hail Mary” pass from Aaron Rodgers against the Lions; Bart Starr’s quarterback sneak to win the “Ice Bowl”; Jim Taylor scoring the first rushing touchdown in Super bowl history; Packer kicker Chester Marcol catching his own blocked kick before running it in for a touchdown; and the start of Ahman Green’s 98-yard touchdown run (the longest in packer history) and many more capturing moments in Packer history. A tailgate party and photo auction will take place on January 27 from 4 to 7 p.m. with all proceeds benefiting future ArtStart exhibits. ArtStart is a nonprofit 501 (c)3 organization located in the historic Federal Building in downtown Rhinelander with a mission to inspire, challenge and educate through cultural events and highly-distinctive, curated visual art exhibitions with the purpose of strengthening and sustaining our community. For more information, contact ArtStart by phone 715-362-4328, email info@artstartrhinelander.org, or visit ArtStart’s Facebook or website www.artstartrhinelander.org.